I’m sorry to report (and, on top of it, sorry I’ve been away for so long) that Gregg Gale, the owner/operator of what used to be Speed’s and is now Boston Super Dog, passed away this morning. 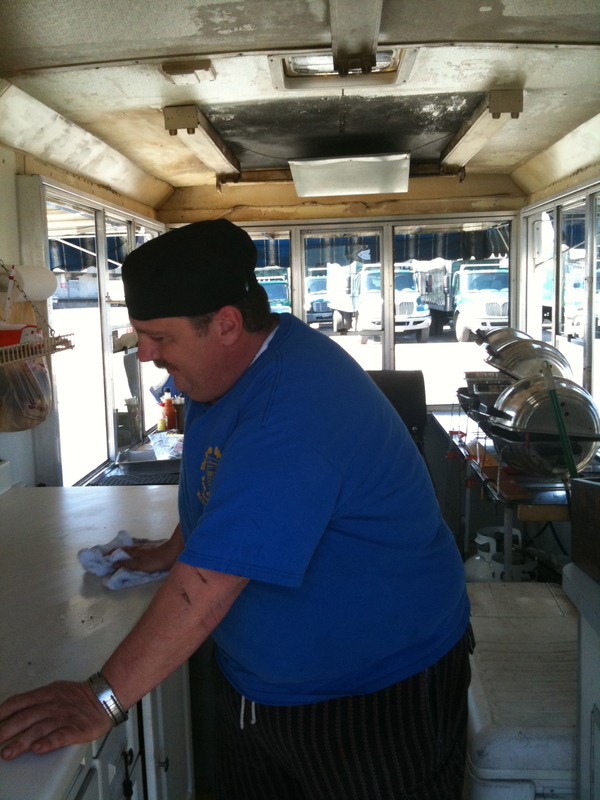 Gregg had been running the truck for as long as I’ve been visiting it in Newmarket Square and not only did he serve a delicious dog but he was a very kind man whose love for his job was always evident. In the past five years, I’ve probably visited the stand 10 times and the dog was always an astounding experience–and this was recognized by many others, such as the Wall Street Journal (which named it the best dog in America), Holly Eats (one of my favorite road food websites), and almost annually in the Boston Magazine as Boston’s Best Dog. We’ll certainly miss Gregg and hope that someone will step up to carry on the tradition. Even though it’s October, let’s take a trip back to the beautiful days we had back in August. I drove with Ali and The Kid to western NJ, so I could drop them off at a family event. I had been planning on hitting up some NJ HDJ’s, and was very excited to see that I was only 15 minutes away from the legendary Charlie’s Pool Room. While doing a little research though, it turned out that Charlie’s had gotten a visit by health inspectors some time during the year, and basically shut down their kitchen, which I think was just their hot dog operation. Not sure about their current state, but it sounded like the brothers who run the place had some renovations to take care of to bring it up to code. No Charlie’s Pool Room for me that weekend. However, I had a couple of other places in mind: Hot Dog Johnny’s and Johnny & Hanges. 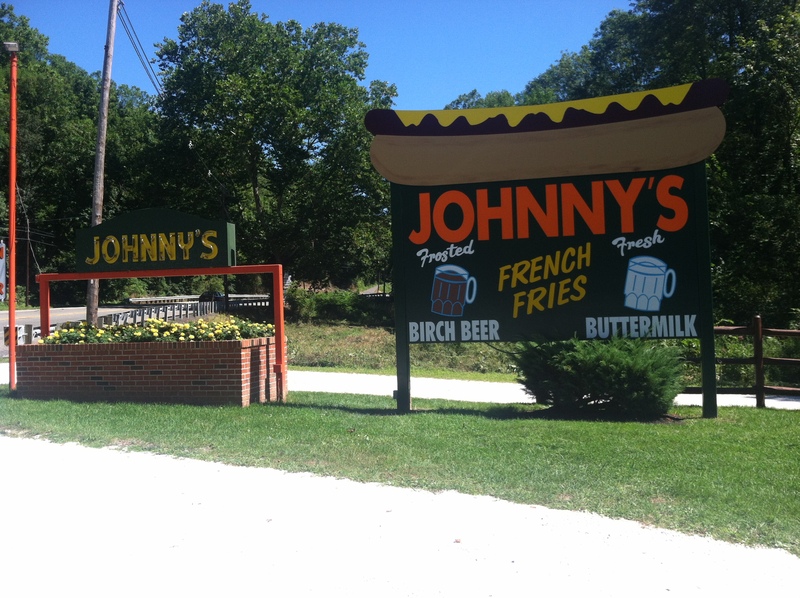 The latter was too far away, but Hot Dog Johnny’s was just a 25 minute ride north to the town of Buttzville. I set my navigator, rolled down the windows, and cruised triumphantly through miles of beautiful hilly NJ farmland. 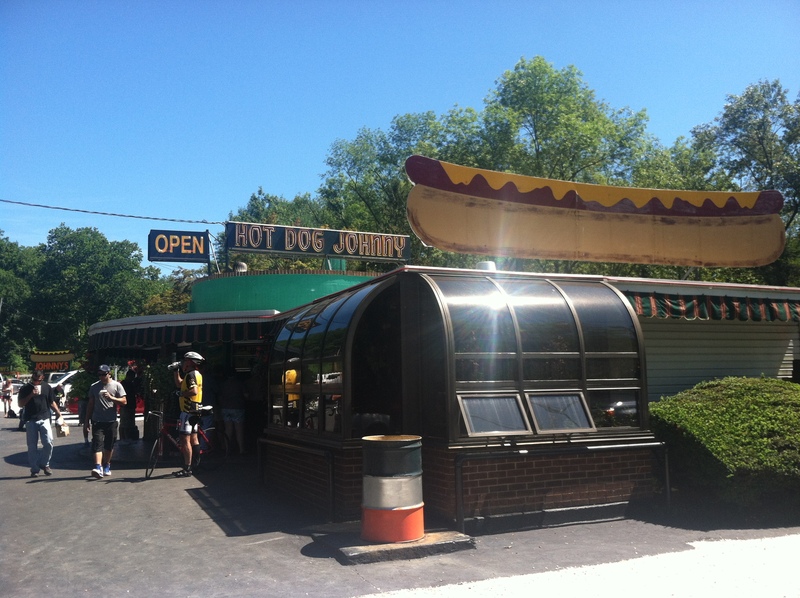 The weather was perfect that day and brought out the hordes to Hot Dog Johnny’s. Locals, foodies traveling from distant locales (like Brooklyn for example), families, and groups of bikers all came out for the same thing: the perfect roadside dog. The stand has got to be the Shangri-la of HDJ’s. 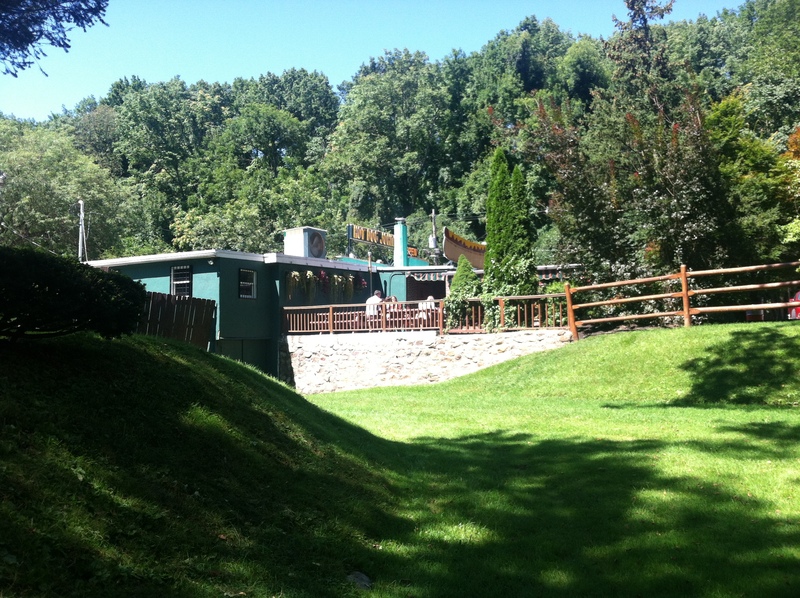 It sits on land with trees and hills on one side, and a lush grassy oasis overlooking the Pequest River. The stand itself has several walkup counters, old painted messages on the walls, and an open but covered picnic table section with tons of colorful plants. You can’t beat this place for atmosphere. 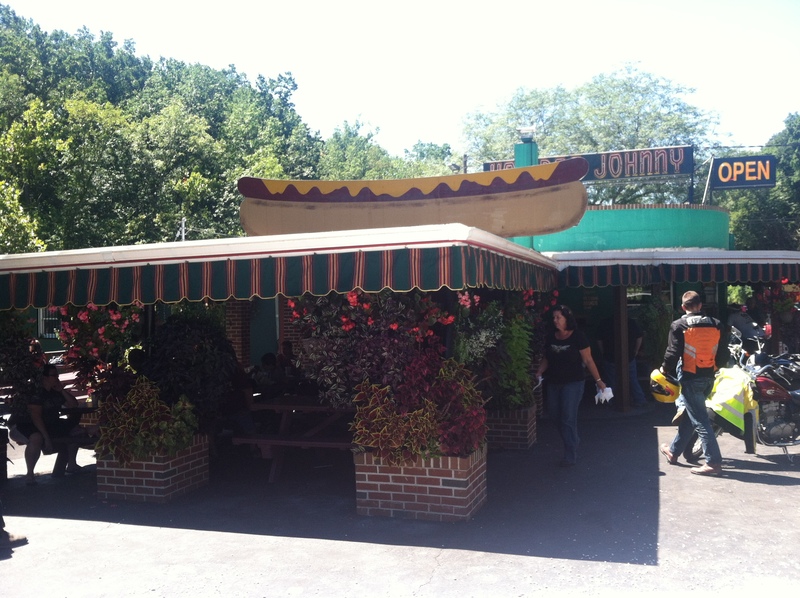 There is not much I can add to the blogosphere on Hot Dog Johnny’s. You can find a lot of articles and posts about this place, and rightly so. It’s a fun step back in time with a helluva view. The hot dogs here are cooked in peanut oil, then wrapped up and delivered in paper. These are easy 3-4 biters (4 if you want to savor it). When you order one with everything you get chopped onions, mustard, and a pickle spear. 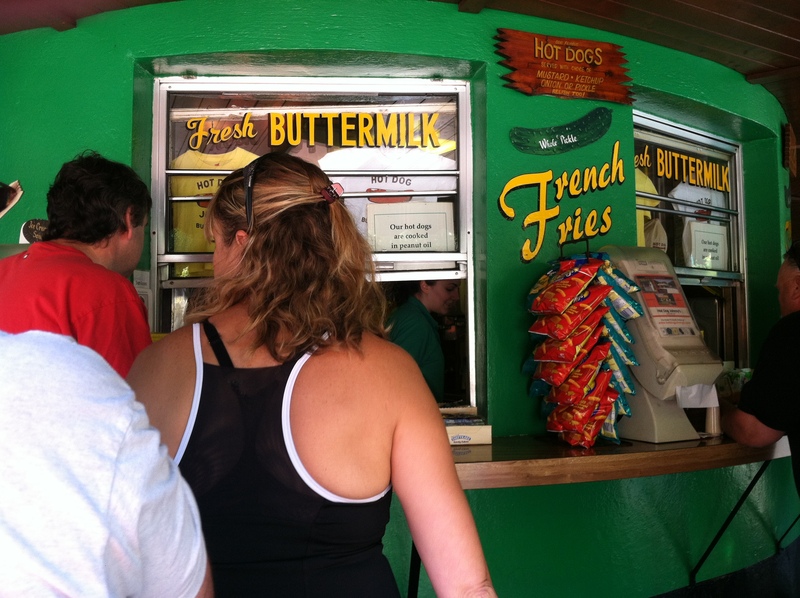 They are also known for their frosty mugs of buttermilk. I’m usually a sucker for anything that sounds unusual, but I opted for the mug of birch beer instead. I’ve never had buttermilk, but the internet says it’s got a sour taste. Plenty of people order it however, and it’s been a staple there for decades. Also, living in NYC makes me totally appreciate the cost of practically anything when I put some miles between my destination and home. I ordered 2 dogs, french fries, and a large birch beer for a total of about $6. But these are not artisanal dogs. These are dogs for the people, dogs you eat 2 or 3 at a time. I briefly chatted with my picnic table companions and chowed. The freshest buttermilk in town! At this point I felt that 2 dogs were not enough. 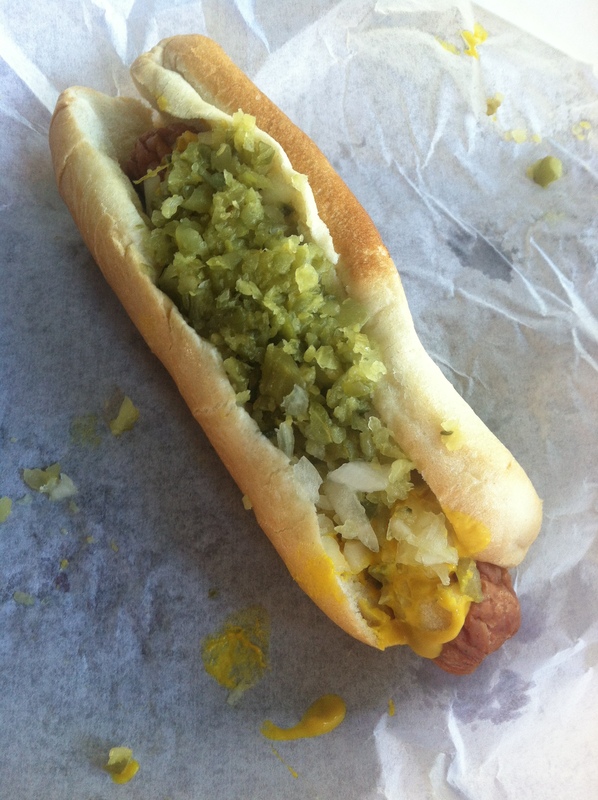 I had to get one more with relish, which was more of a dry topping but keeping the sweet pickle taste. Usually relish has a lot of liquid runoff but this did not have any. I washed this one down with an orange drink and a Hershey’s chocolate chip cookie ice cream sandwich in a cup. 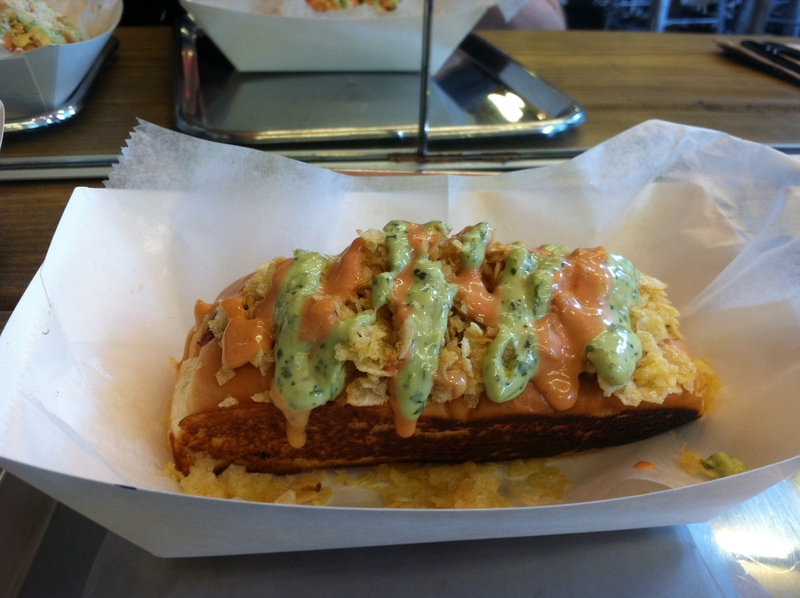 Hot Dog Johnny’s is a place that you need to go check out. 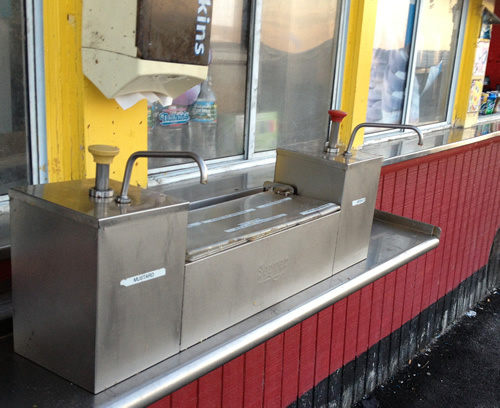 It’s a great example of a multi-generation, family-owned roadside stand. It’s incredibly popular and everyone travels to go check it out. 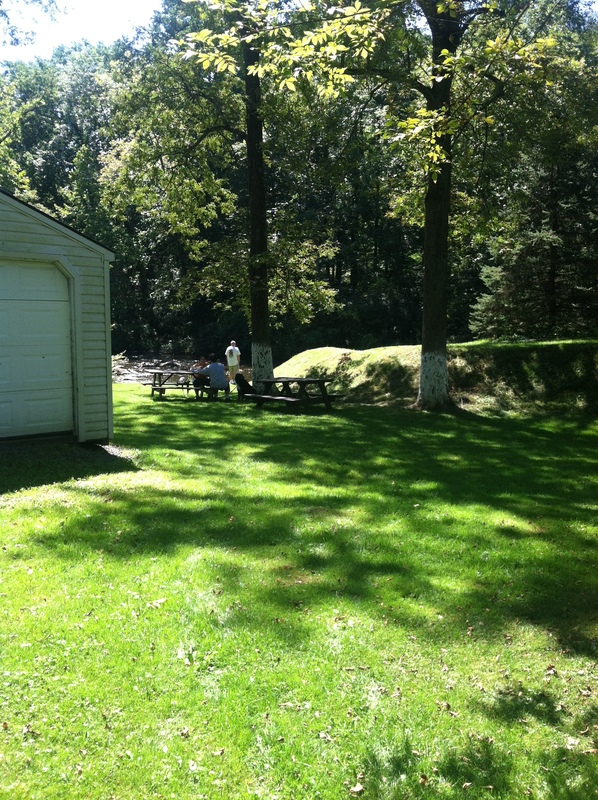 It’s in a region of New Jersey that most people don’t know about, with beautiful farmland and rolling hills. 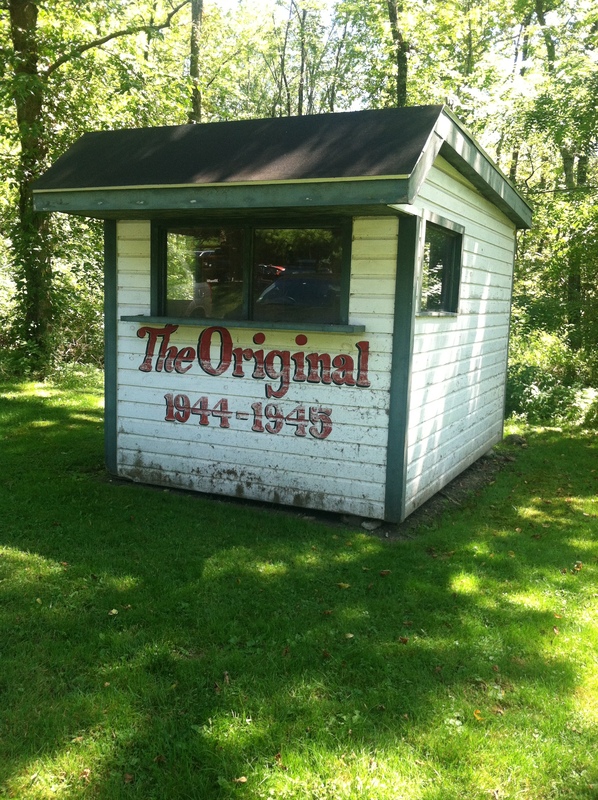 And while you’re taking a carefree ride around the area, you can stop here and spend $1.50 on a hot dog! 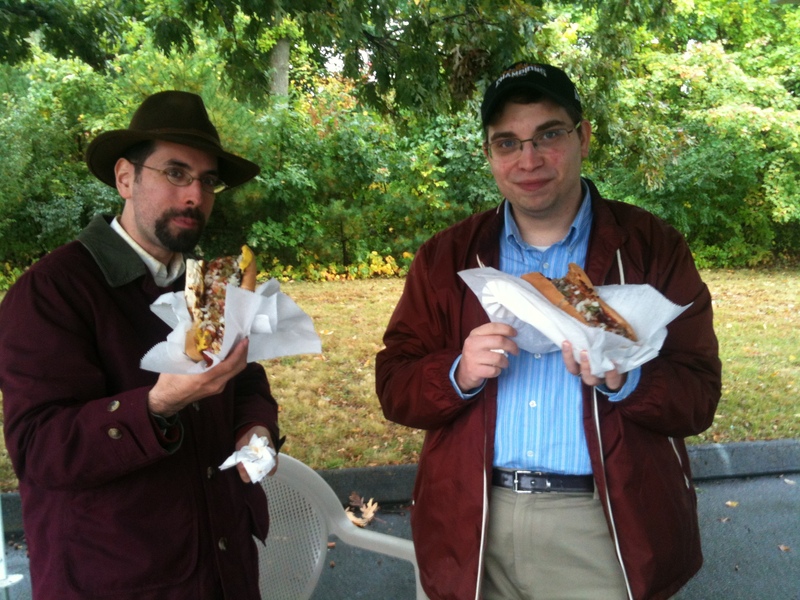 There’s something amiss in the hot dog-blogosphere in 2013. Not a lot has been been written by us or our meaty colleagues. And I’m not really sure why that is, but maybe there are a number of reasons. Perhaps everyone has high cholesterol and blood pressure, necessitating a change in diet. Maybe the economy is getting better, and we have been moving away from comfort food. Or maybe there just haven’t been any notable HDJ’s to write about. In NYC, it seems as though the artisanal and hip HDJ’s may be another food trend that has come and gone. There’s not much standing, except maybe Bark and Japadog. 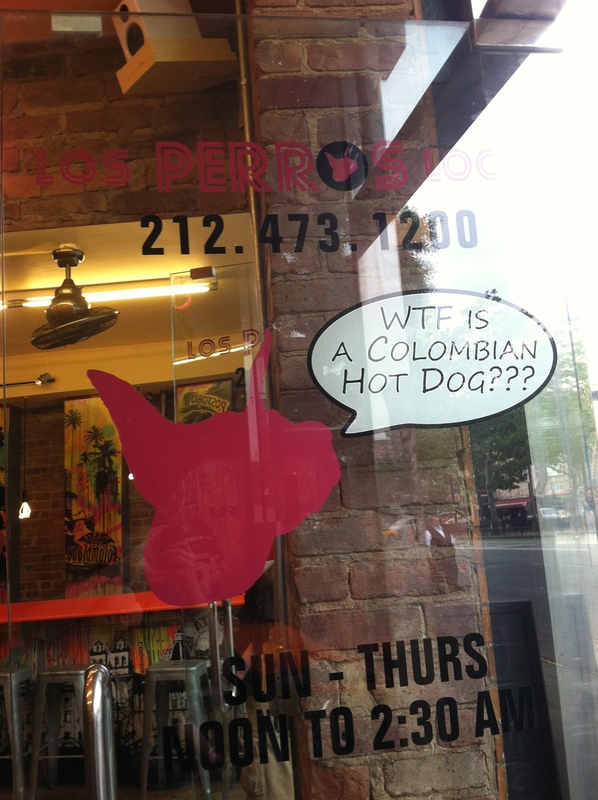 But now there’s a place on the lower east side that is trying to channel the spirit of Colombian hot dogs. Hopefully they will have what it takes to stick around in NYC’s volatile food scene. 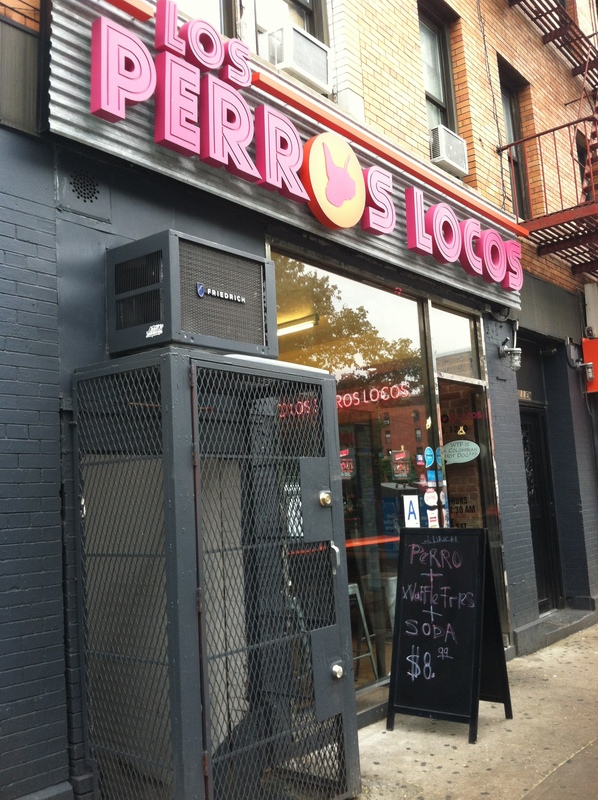 Los Perros Locos opened up in NYC pretty recently in January 2013. Seeing as how I now have a new 6-month old roommate, I don’t get out for much exploration, even though she is usually up for it. Seeing as how I have some time off of work, the two of us decided to take a trip to see what Los Perros Locos was all about. I can refer you to the website to get an idea of how this place came into being. However, even without knowing anything about the place, you’d have to guess there was some connection to Miami or perhaps California. The two of us went on a random weekday afternoon, so there were not too many people there. However I can imagine the NYU and LES crowds mobbing the place at 2am. We walked inside to a neon wonderland, complete with a built in skate ramp leading down to a counter where patrons eat layered and loaded dogs. The small space (maybe 100 sq ft?) 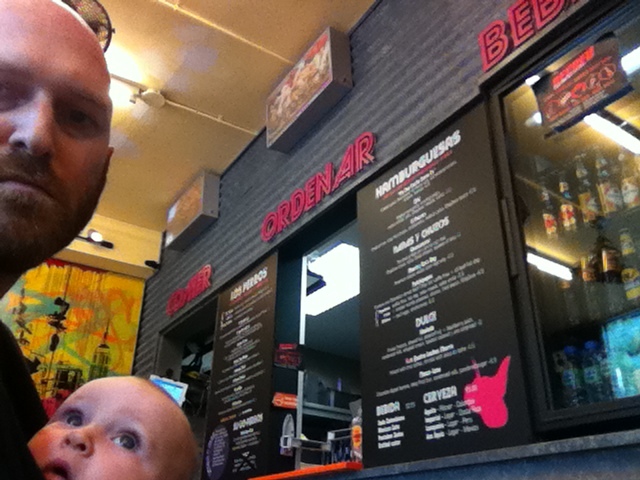 ended with 3 windows capped with the pink neon words comer-ordenar-beber (eat, order, drink). 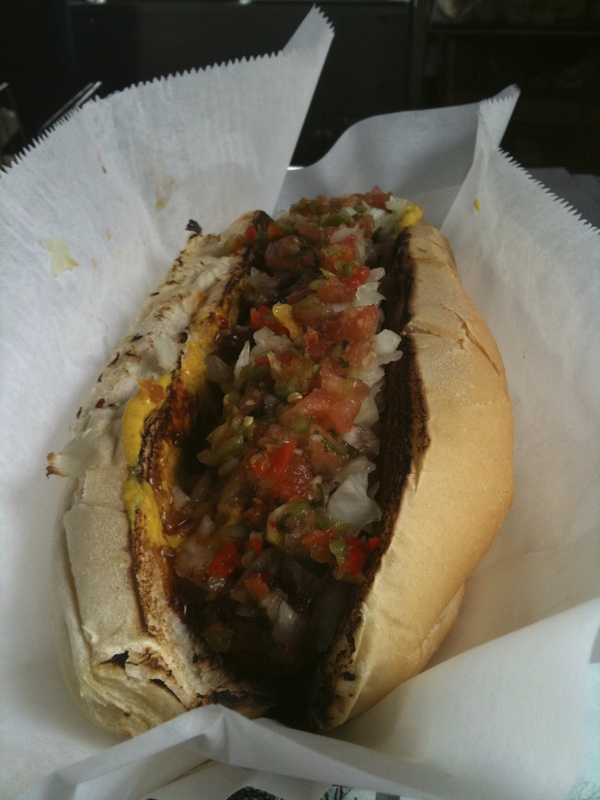 I had some knowledge of Colombian hot dogs, and have been thinking for a long time that I need to get out to Elizabeth, NJ to find something authentic. 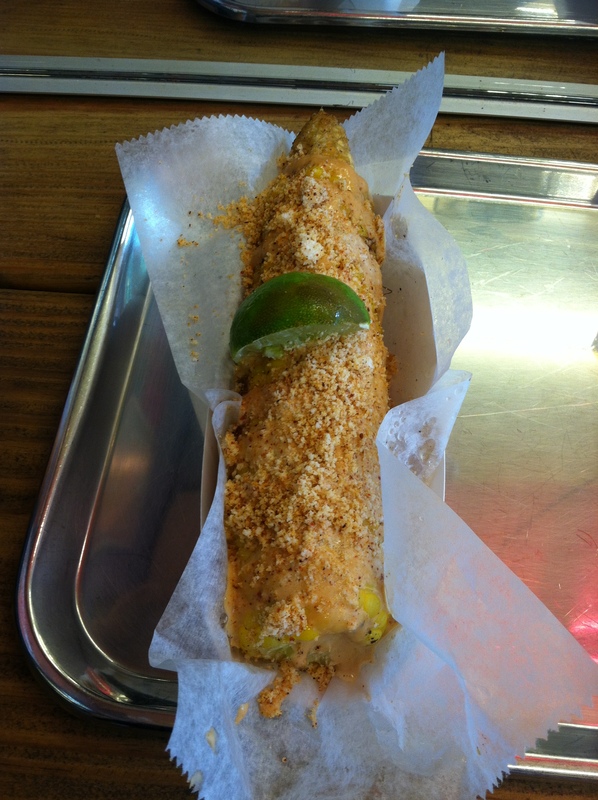 (Also make sure to check out Hawk Krall’s post from a few years ago in Serious Eats about Colombian dogs in Queens NY) I’ve heard that the Colombian dog has potato chips and pineapple as toppings. 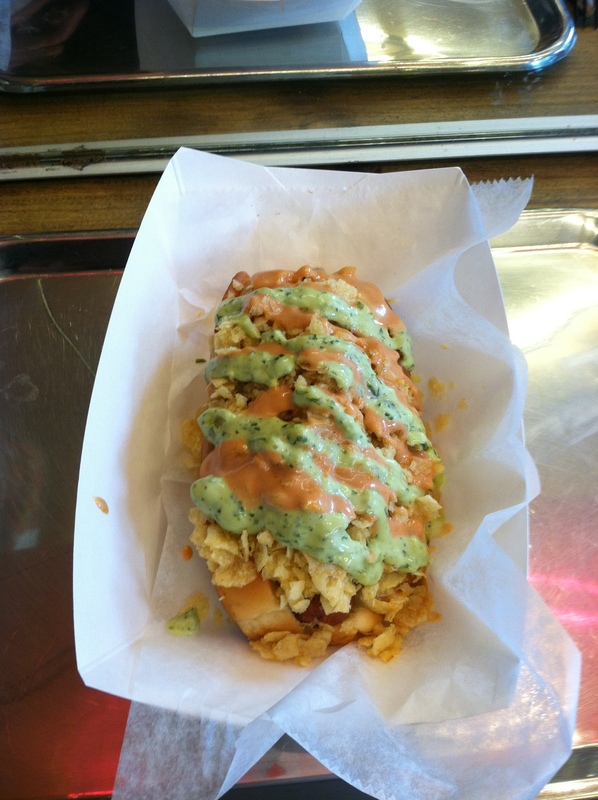 It seems that the folks at Los Perros Locos took that idea and also expanded on it with a plethora of salsas and other toppings. I ordered up two dogs, a grilled corn called Mazzzzzorca, and a Colombian soda. I called this post ‘Digging Deep’ because the dog itself is only part of the sandwich, and you have to get through the layers of toppings first. I had a similar experience with the Chilean vienesa which was loaded with avocado, tomato, and mayo. I should say that while I did enjoy these dogs, they are not meant to be eaten while a tiny human is strapped to your chest. What delicious mysteries lie beneath? You can order each sandwich with a choice of all beef (skinless), veggie, or chorizo. I opted for all beef and began to tackle the [No] Tipico, which I think may be the closest to the actual typical Colombian dog. 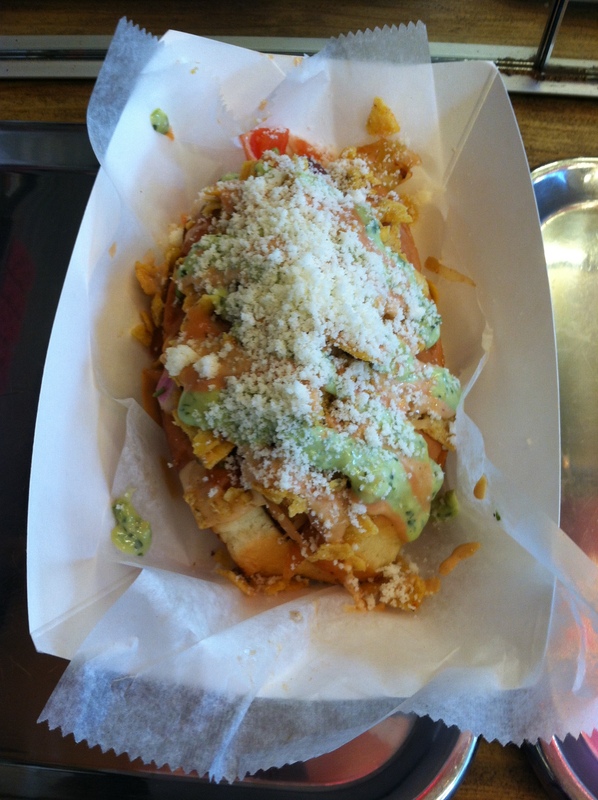 This dog is layered with crushed potato chips and 4 different kinds of salsas: pina (sweet pineapple), ajillo (roast garlic), rosada (pink sauce), and verde (creamy avocado), all on a beautifully grilled & buttered split top bun. This next one is the Mexi-Max. 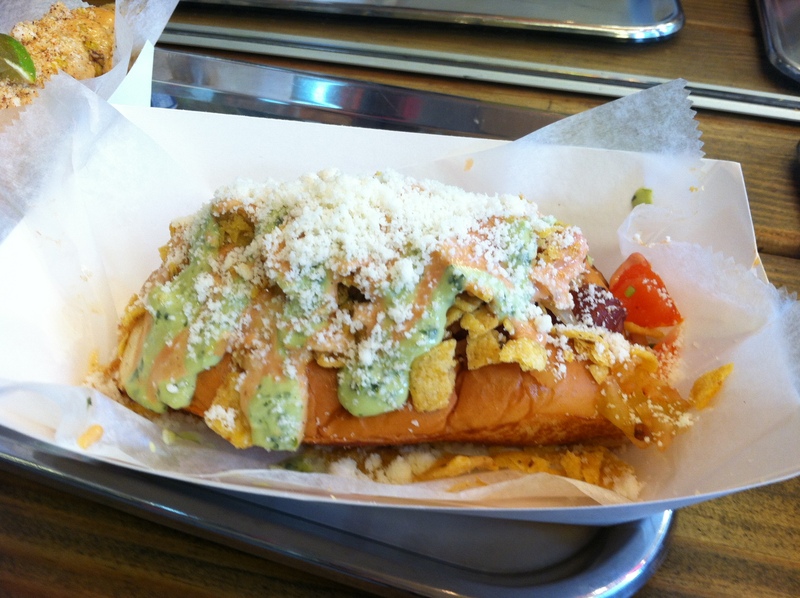 Here we see the all beef dog topped with sriracha pico de gallo, chipotle kraut, ChipZana sauce (chipotle & manzana (apple)), salsa verde, grated queso cotija, and crushed fritos. I’m a big fan of people trying to create anything, and also a big fan of eating. These dogs definitely have pros and cons. 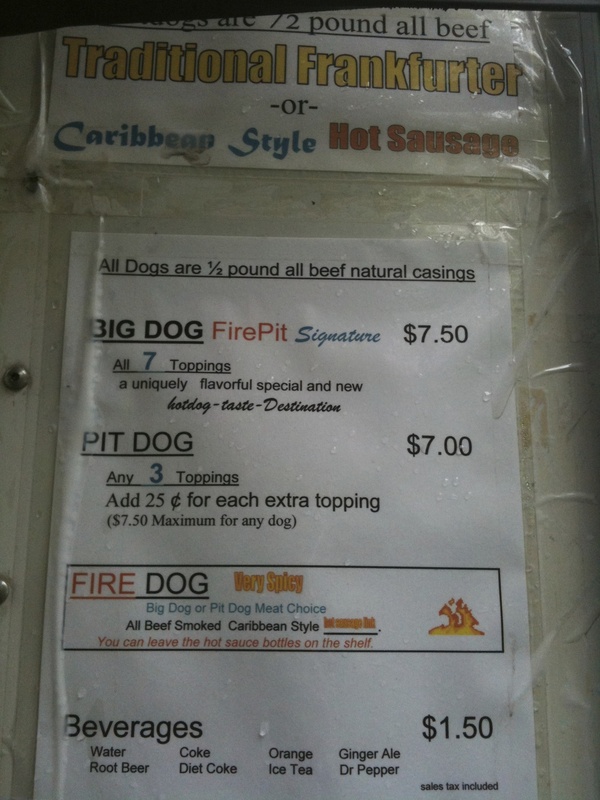 I enjoyed the assault of flavors, and I love a challenge of eating a hefty dog. 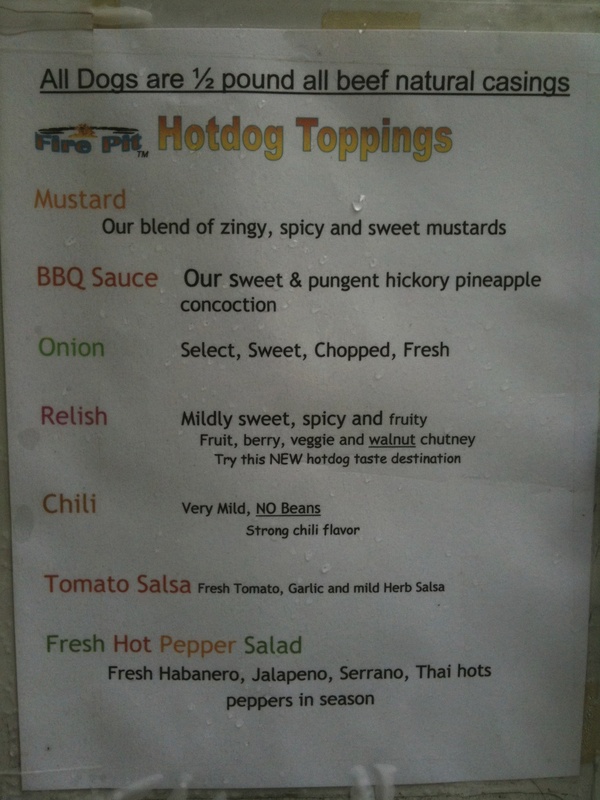 However, some of the flavors on these dogs were so much stronger than the others that it covered up the other good stuff. Plus you can’t take a bite without getting toppings all over your face, or all over the little one hooked on to you, which also meant that I had to eat the Mexi-Max with a fork and knife. The dog itself is grilled but it also sort of gets buried underneath everything. It also could have been a bit bigger. I’m sounding more like I did not enjoy myself and that’s not the case. Lately though, I really appreciate simplicity and distinct flavors. When you have 6 or 7 colors on top of each other, you can’t really see the individual colors anymore. Some of these toppings sound so interesting and it would be great to see what chipotle kraut or sriracha pico de gallo tastes like on a less busy dog. But since I’m not Colombian, it’s probably easy for me to find something wrong with such a different and distinct regional style. For me, the toppings that did stand out were the Fritos (awesome!) and the chipzana sauce, with the apple surprisingly shining through. These guys opened up in January with a very adventurous and ambitious attitude. The dogs I got seem to have the most toppings on their menu, and perhaps I should try some of the others with only 3 toppings. Maybe the Mas Perfecto with apple chipotle slaw and quail eggs. Or the Spicy Spicy Mango with spicy mango mojo, melted mozzarella, and crushed hot Doritos. They also have a corn dog and three different kinds of salchipapas. I should also add that the Mazzzzzorca was very tasty, also messy, and topped with chipzana sauce, grated cotija cheese, and a squeeze of lime. 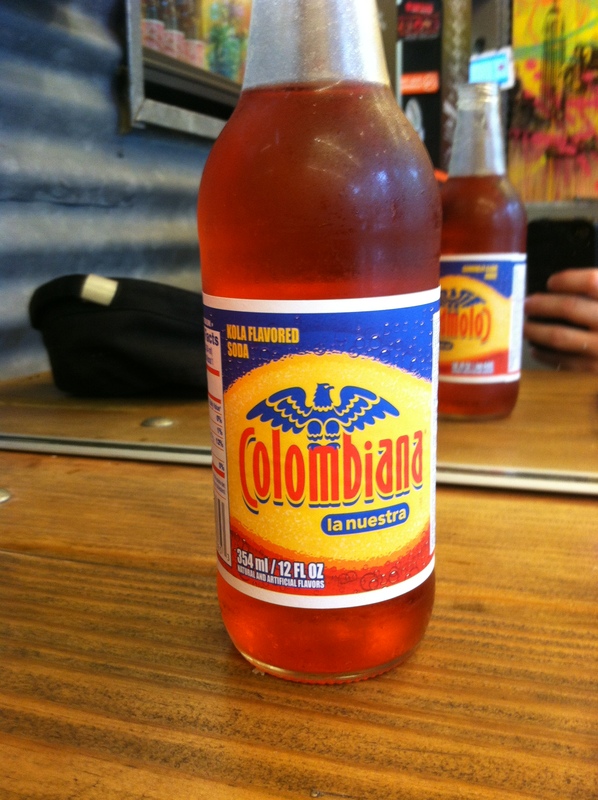 The Soda Colombiana was also refreshing and tasted like cream soda with less sugar. I think these guys will do well with the lower east side crowds with this fun and crazy menu, and with people who can afford to get messy. The Kid is up for adventure, but I still have to look out for her! On the one hand, I should have known better. Daddy’s Dogs in Hull, MA, is only open during high beach season and their web site proudly announces their hot dog eating contest….in 2006. On the other hand, it’s part of a well-known restaurant called Daddy’s Beach Club, so it was really a coin toss. In a perfect world, a hot dog stand that faces the big blue Atlantic from across the street would be as perfect as one might imagine. I probably should have backed away at the first sight of a $4 foot-long dog and $3 regulars, but as a Dog Blogger I sometimes have to fly in the face of my own reason. 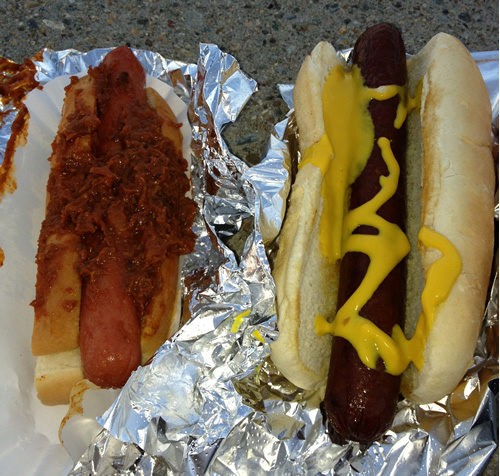 So I bellied up to the slightly grimy counter and ordered one Daddy Dog (the big guy) and one chili dog. Beyond that, your options are cheese, of the runny nacho sort, and….okay, well, that’s it. Straight, chili, or chili and cheese. Holy mother of Dog, why didn’t I run when I had the chance? Where those ladies are? That’s where you don’t want to be. As you can see from the above photo, they proudly serve Nathan’s hot dogs here. I can vouch for the small dog being of said pedigree, but I’m not so sure about the big one. Although I could see that they do all their work on the flat top, if I had to guess I’d think they actually carve the foot-longs out of cherry or mahogany. 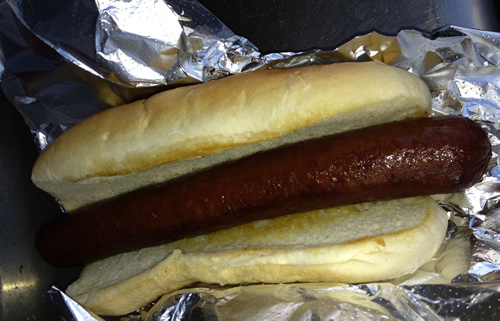 It’s the only thing, outside of a hefty and negligent dose of overcooking, that could explain this color on a hot dog. Let it be noted that I came here after a long, crappy day at work. I wanted to have a walk along the beach and then, seeing that Daddy’s was open, figured what the heck? How bad could it be? It’s a freakin’ hot dog at the beach. In the Old Country, they use tales of the outdoor Serv-Ya-Self station to scare children. So, yeah. Just mustard. As for the chili dog, it didn’t take an encased meat expert to tell that it wasn’t a good sign when the counter gal had to poke at it with her ladle to loosen it up. It was sitting in a bin on the flattop, so one might figure, you know, warmth. If this was a tag team, it’d be the Legion of Doom. I dove into the big one first. Overcooked, indeed. The large, dry-griddled bun tried to help but a) it could have used some butter and b) it was busy holding a big, overcooked hot dog. Then, adding insult to injury, I took a nice bite of the chili dog and was treated to, yes, quite cold chili. Again, maybe I should have known when the chili actively fought being put on the hot dog. But no, I had to taste it to learn the error of my ways. And I don’t mean this was a little less warm than one might like. It was, hey this chili is cold cold. Like, I should be ashamed to sell this chili cold. 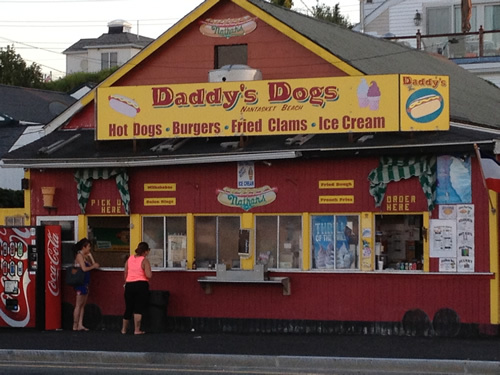 I am sure that Daddy’s does a brisk business on hot summer days, selling to non-discerning, non-hot-dog-blogging folks whose only culinary criteria is the fact that it’s literally 50 yards from the beach. And maybe one of the little dogs, on such a day, with just a schmear of mustard would more or less hit the spot. I mean, it’s a Nathan’s dog, how bad can that be? (Under normal circumstances.) But this is not a spot for people who appreciate a good dog. What they do here would just make you cry. It makes me miss the old Joe & Nemo’s that was back down the beach a-ways. Those folks knew how to make a dog. Daddy’s doesn’t. Frank’s restaurant is something of an institution in Brockton, MA. Once the food side of a popular nightclub that’s now a strip joint, Frank’s has been churning out fried seafood, burgers and dogs for decades. You’d think that since I grew up in the area I might have set foot in there before. But I hadn’t. Now at last I have, and I sort of wish…I hadn’t. For me, Frank’s turned out to be a “one man’s treasure” proposition and while folks rave about the fried seafood–and a lot of people got seafood while I was there–it’s not a great find for a hot dog hunter. Behold, Throg! 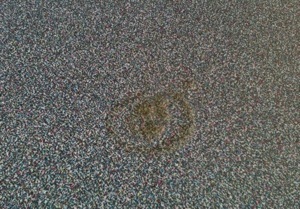 It is the ancient rune of Yech, here on thy table! So what was wrong? Well, the lack of cleanliness was obvious from the moment I walked in the door. Smushed french fries in several places on the floor, every free table badly in need of a wipe-down. After I ordered I sat down, opting for what I think was the cleanest booth–the one that had just a decorative, ancient-runic swirl of some sort of leftover sauce at its center, which I took a picture of before getting a napkin and wiping it off. 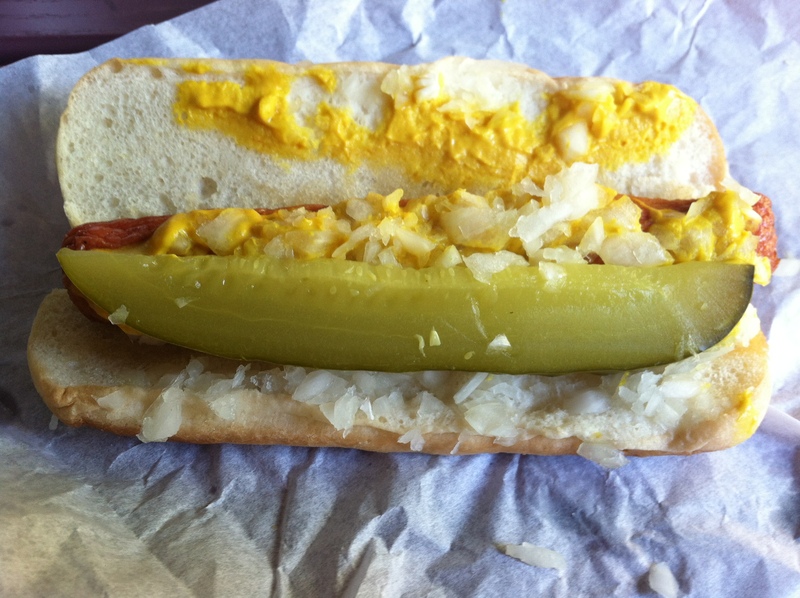 The only dog listed on the menu board is “hot dog,” so when the counter guy asked what I wanted on my two, I played it safe with mustard and onions. The dogs and the rolls get done on the flat-top and while the rolls get a decent toasting, a little schmear of butter wouldn’t have hurt. The dogs were a standard, okay meat frank that didn’t pick up much snap from the griddle, but they were of a decent size, so points there. The onions had that pale, vinegary tang that says “We’ve been here a while!”, so loss of points there. My visit was late in the afternoon and I’d gotten hungry enough to eat just about anything. In fact, I had been looking for an entirely different (non-dog) place and couldn’t find it. So I landed at Frank’s by default. And that was my fault. I think it would have to be under these exact conditions, or one that involved a very late evening and a more-than-reasonable amount of adult beverages, that I’d opt for a dog from Frank’s again. Maybe I’ll go back for the fish & chips sometime. I hear they’re good. Hey there hot doggies! It’s been about 7 months since I’ve ventured out to find something new. 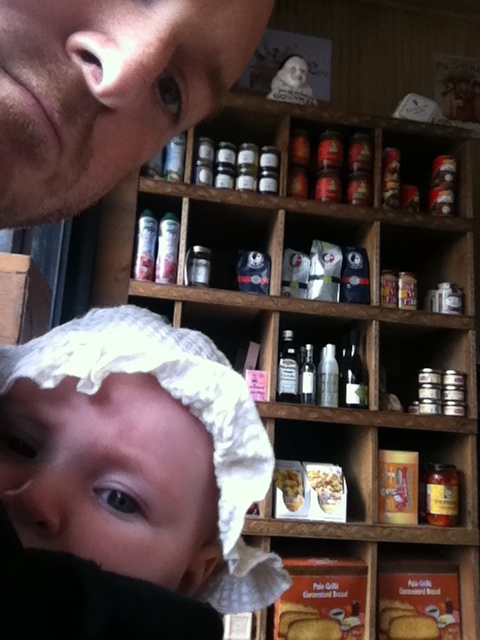 That’s mainly been due to the training I’ve been giving the new 4 month old co-blogger that’s living with me now. I think she’s getting the idea of what we do here, even if she doesn’t eat solid food yet. And recently she said to me “I’m ready. Show me what’s out there in the world of hot doggery.” Yes, she is that advanced. Our fellow blogger, John, usually takes trips to HDJ’s with “the boy.” Now, I’m going out there with “the kid.” Seeing as how she is very young, and I’m getting this hang of this caretaking thing, I decided to try a hot dog a few blocks away from our apartment. I threw on the carrier and we went to a great French cafe and patisserie called Beny’s Delice. 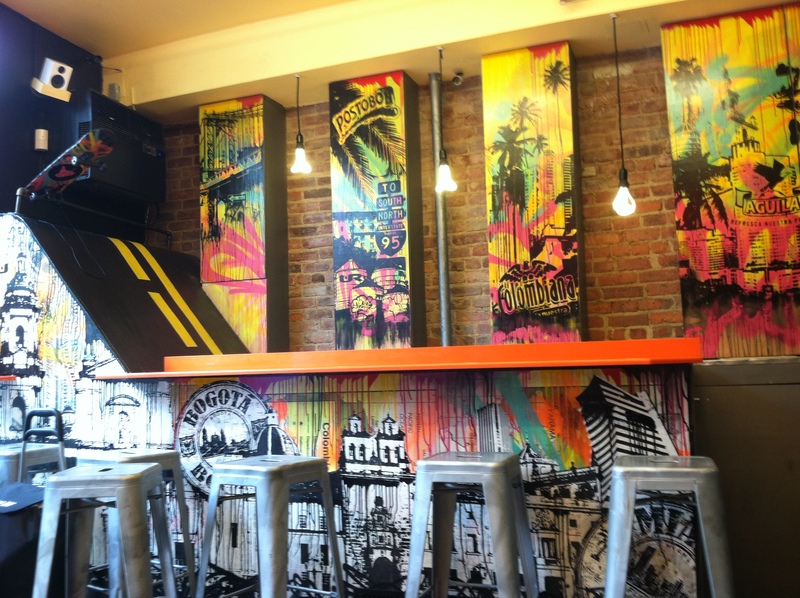 Beny’s Delice has 2 locations fairly close to each other in Brooklyn, but in different neighborhoods. 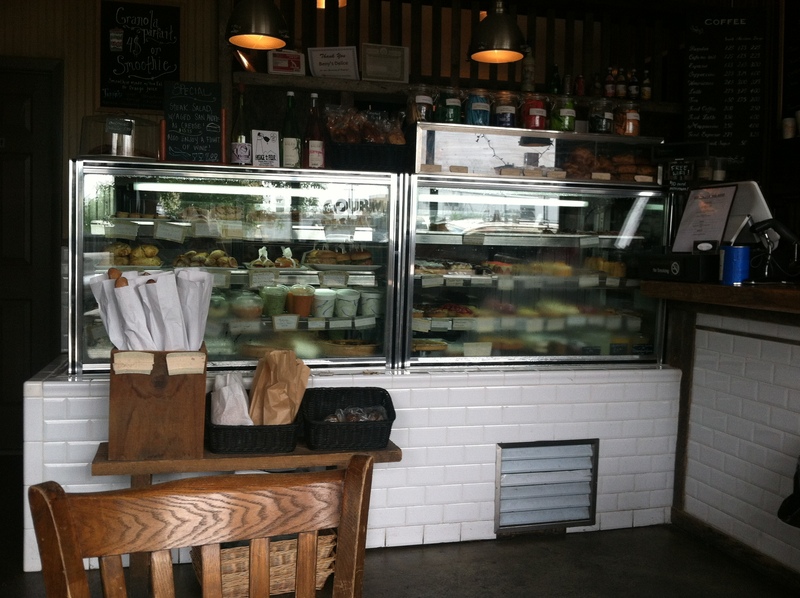 You can get all kinds of pastries, sandwiches, and entrees at the 5-table cafe. They even have a small selection of imported goods from France. 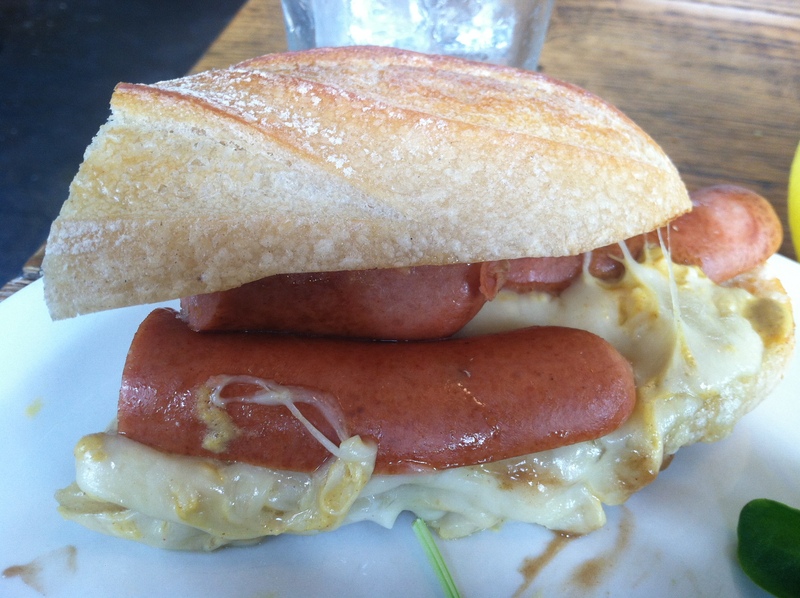 I recently got a goat cheese and ratatouille omelette for breakfast, but on this day, I knew I had to get Le Hot Dog. In the past few months, I have had to re-learn how to eat, since most of the time there is a person strapped to my chest. I try to eat with my head turned about 45 degrees off-center so I don’t drop crumbs and sausage on her head. My arms raise in the air awkwardly and my elbows come dangerously close to the people at the next table. 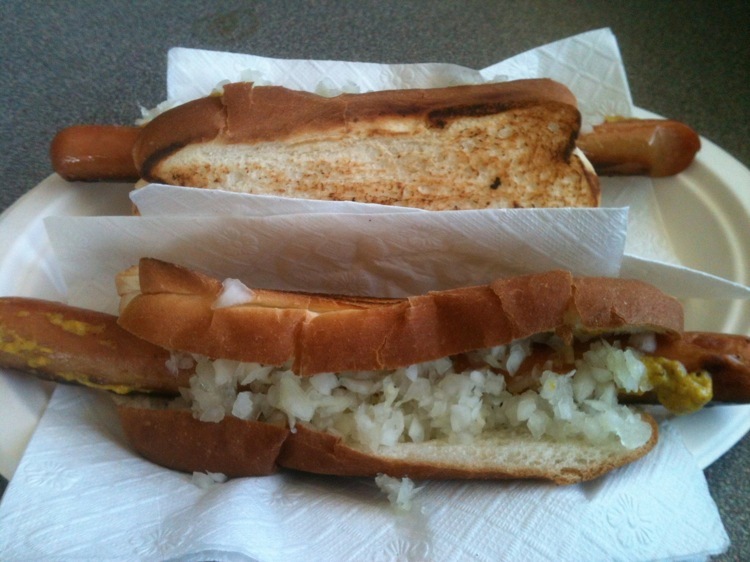 I have come to appreciate neat and containable food, and Le Hot Dog is neither of these things. 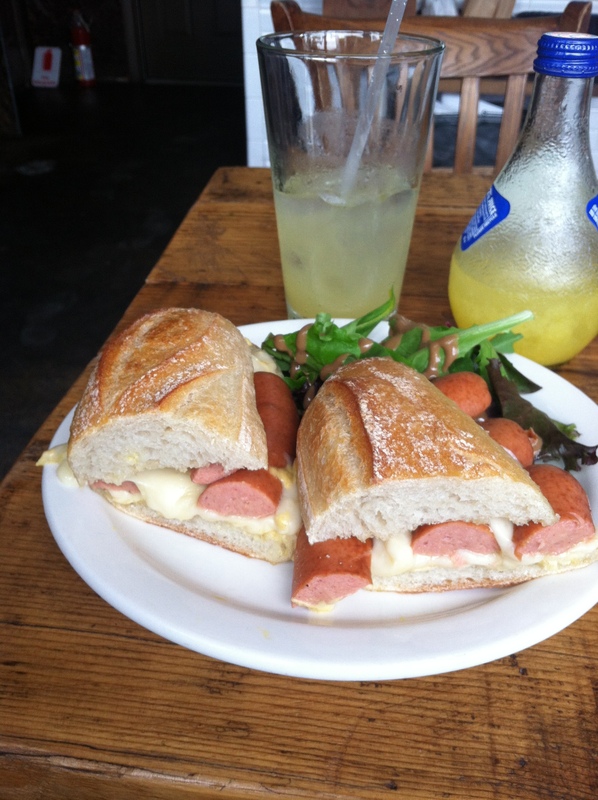 Le Hot Dog is listed as smoked sausage, swiss cheese, and dijon mustard (my new favorite mustard) on a baguette. I was very surprised at how they constructed this, and found that they had cut up about 1-2 sausages in sandwich form. 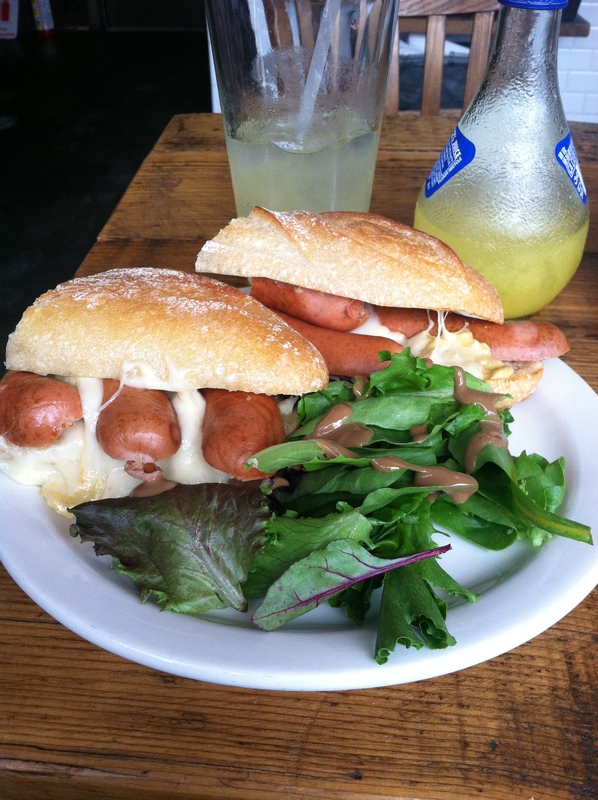 Plus, I usually don’t get a salad with any hot dog I order, so it was nice to have it included. It was an enjoyable sandwich, but there were some terrifying moments, especially when it seemed like the gooeyness would get squeezed out the back end and onto The Kid’s head. But I’m an expert, and I saved it like a boss. Dijon and swiss is a great combination, and both were strong counterpoints to the milder sausage. After getting the dijon off my face, I took The Kid back home, emotionally spent from our adventure. I’ll be heading back soon to get something a little more contained, and a bit more healthy. I’m thinking the Hot Dog & Egg croissant with swiss cheese. I’ve been keeping a secret to myself and it’s time I let you all in on it. In the town of Mendon, Massachusetts, settled in the parking lot of a hardware store, you’ll find a hot dog that’s not only the best in New England but one that represents what may be Massachusetts’ most historical hot dog. Ladies and gentleman, meet Larry Joe and his New England Firepit: I came across Larry Joe’s a couple of years ago when he was in Bellingham in a truck that later, most lamentably, burned down. Larry Joe’s was shuttered for the better part of a year while he was custom building his new truck, which is a real beauty. Now I’ll be entirely honest: I don’t think there’s any other reason why someone would have traveled to either Bellingham or Mendon unless they needed one of two things: to get home, or to devour one of Larry Joe’s hot dogs. With the exception of the ladies of Snappy Dogs located about a 15 minute drive away, there’s nothing else around here that would draw your attention. Which is why you should be impressed: I’ve traveled the hour-plus it takes to get to Mendon and did it with a huge smile on my face, ’cause I knew what a treat I was in for. I’m planning on doing it again. In fact, when I was prepping to write this blog the thought burst into my mind–why not just drive down again so I can refresh my memory? And this, of course, is the reason why. Look at that beautiful mess! 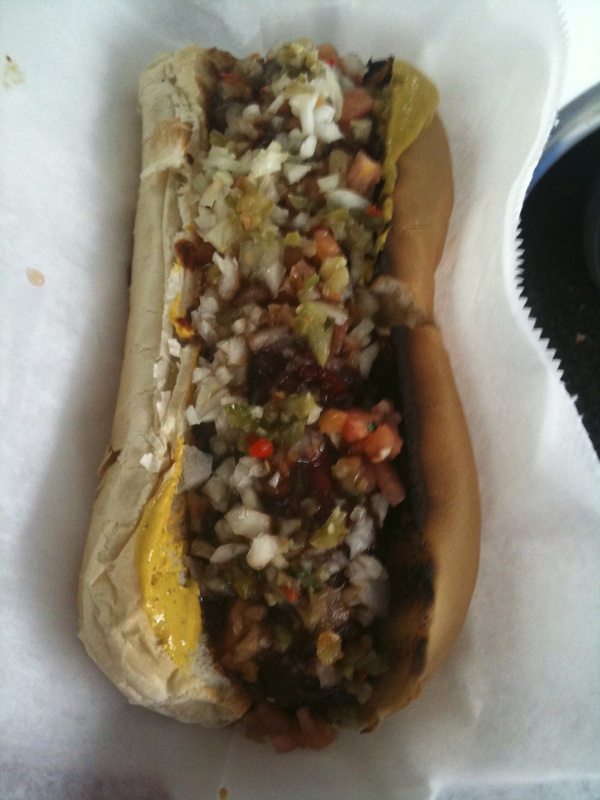 This dog is topped with a blend of three mustards, a sweet BBQ sauce, chopped fresh onions, a mild no-bean chili, tomato salsa made that morning, a spicy hot pepper salad, and a jaw-droppingly delicious (not to mention expensive, the ingredients cost about $50 a gallon) relish. With the many layers of flavor going on, it’s a difficult dog to describe properly: the savory flavors are predominant, with sweet levels throughout due to the BBQ, mustard, and relish. Alongside that travels an undertone of vinegary tang which, paired with the fresh vegetables, brings the dog back from the brink of being almost too deep of a flavor. Top it off with a slight heat from the pepper salad, the smoke of the hickory, and the big beef flavor of the dog and you’ve got yourself a flavor profile that I could go on about for at least a few more paragraphs. 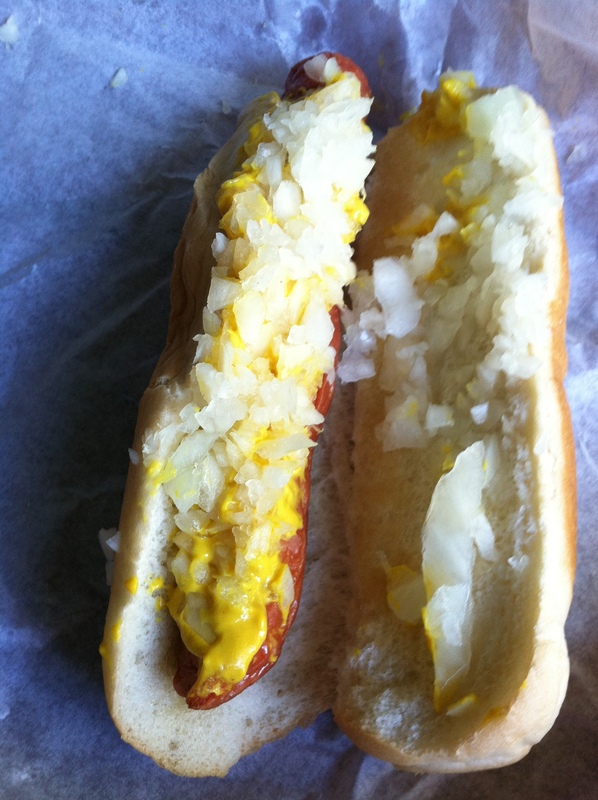 By now I hope you’re wondering what I meant by this being Massachusetts’ most historical hot dog. Well, Larry Joe is carrying on a tradition–a tradition that, for many years, was kept by the legendary Boston’s Speed who set up in Newmarket Square. The tradition goes earlier than that, however, to the time of FDR–as in Franklin Delano Roosevelt. The short of it is that the President was entertaining guests from across the pond–guests who knew a good frankfurter when they had one. So, in order to impress them, FDR decided to have his White House chefs cook up a frank that couldn’t be beat–and do it big, just like we in America are so fond of. 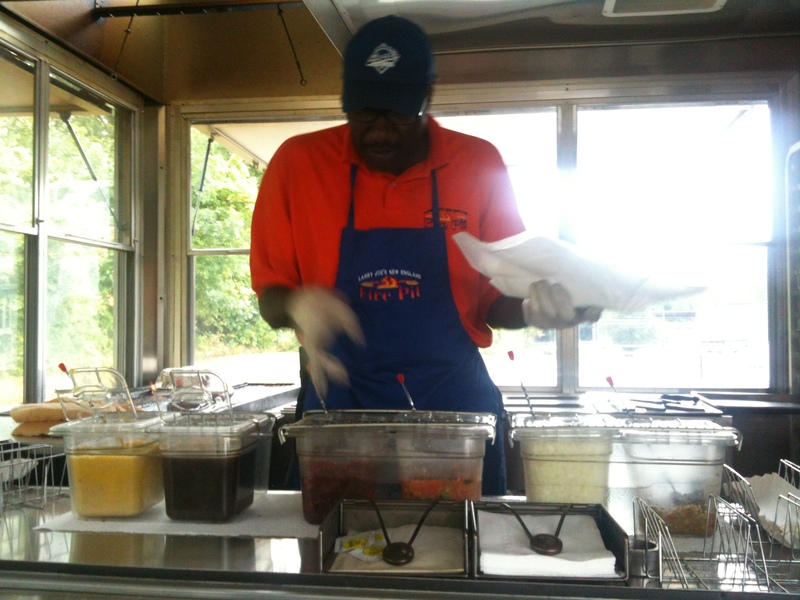 At the time, the chefs were predominantly African-American and in love with BBQ; they whipped up a dog that was marinated, smoked, and slathered in toppings similar to what you’ll find at Larry Joe’s. If you’d like to learn more about the history that Larry Joe shares with Speed, check out the Hot Dog Man’s videos on YouTube. You won’t be sorry to watch it, Larry Joe tells a great story. The second time I came around I brought some of my co-workers and friends, who had no idea what they were in store for. Look at these dapper men! Too bad they’ll soon end up with half of those dogs on their shirt fronts. Larry Joe may be the most dedicated hot dog truck operator in Massachusetts, keeping it open year round unless there’s some truly horrific weather or a really good football game to watch. He’s also one of the most talkative, holding court at his stand for as long as you’ll listen. I’ve gone twice and spent almost three hours there each time, learning about the dog’s history, his cooking techniques, the time that he spent in the military as a nuclear technician, his wide-ranging and fantastic taste in music, etc. To top off the fact that Larry Joe makes the best dog in New England, he’ll also treat you to a song at no extra charge. Here’s a couple of songs I recorded, the first being the iconic “Hoochie Coochie Man” and the second Larry Joe’s tribute to Pinetop Perkins, who had died the day before my first visit and was promised to be played the next time I stopped by. If those aren’t reasons enough for you to drop whatever you’re doing and drive to Mendon, then what the heck are you reading this blog for?